What’s New in VideoStudio Pro X3? Since it seems to be the new trend for multimedia software to come out with a new version or upgrade every 6-12 months, many video aficionados have been awaiting news about the X3 version of Corel VideoStudio Pro. If you’ve been holding out for the new release before making a purchase, the X3 version was worth the wait. Rather than just toss in a couple of added features and ship a supposedly "new" product, Corel has made some substantial changes to VideoStudio Pro X3 that result in enhanced performance, faster editing speeds, and improved workflow as well as the inclusion of new tools and effects. In this review, we’ll take a look at some of the video editing software’s new features in addition to the improvements made to older features due to improved performance and workflow capabilities. Some of the biggest issues with video editing software center on performance and stability. The plain fact of the matter is that, in general, video creation and editing are very resource-intensive processes that can easily bog down a PC, especially if you’re working with large files and want to add a lot of fancy effects. Because of this, it’s not uncommon for video editors to hang or crash – often at the most inconvenient times. With this in mind, Corel seems to have put a high priority on performance issues when developing VideoStudio Pro X3. This new version of the software takes advantage of some of the latest PC technologies, including multi-core and GPU parallel processing, to make video editing faster and more stable than in previous incarnations. 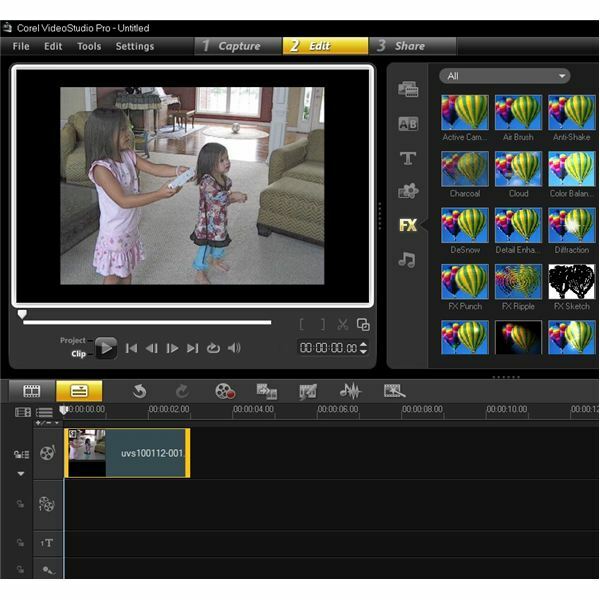 In addition, the VideoStudio Pro X3 bundle includes VideoStudio Express 2010 – Corel’s lighter video editor that can also be purchased as a stand-alone product. With this bonus, you don’t have to start up the main full-fledged editing application every time you want to make a fast, simple edit or create a quick movie. Instead, you can just access the lightweight Express version and get the work done even quicker. Another major improvement in VideoStudio Pro X3 is the redesigned user interface that allows for a more streamlined workflow process and makes it easier to find the tools you want to use. The main interface has three primary tabs: Capture, Edit, and Share. Even if you have a project in progress, you can quickly navigate from one tab to another without worrying about losing your work. Common tasks are clearly labeled and accessible on each tab. Additional tools are still easy to find with drag-and-drop functionality making it fairly simple to start creating a basic video with little to no prior knowledge of the software. The real emphasis of the software is to try to remove as many technical hurdles as possible so that you can concentrate on the more creative aspect of video editing. For additional help, you can click the Get More icon in the upper right-hand corner of the application to access the Corel Guide. 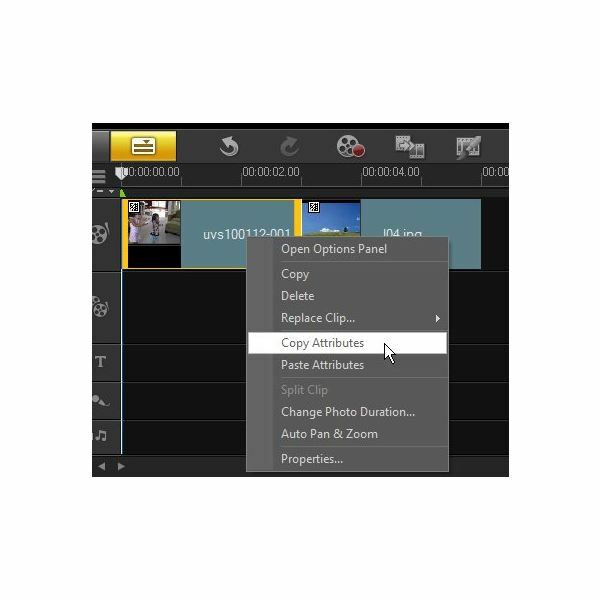 This built-in guide gives immediate tips on a number of the software’s features and also lets you access new creative content for VideoStudio Pro X3 as it becomes available. Corel has stated that new content will be added and updated on a regular basis to Corel Guide, including such things as additional tutorials and creative tools. 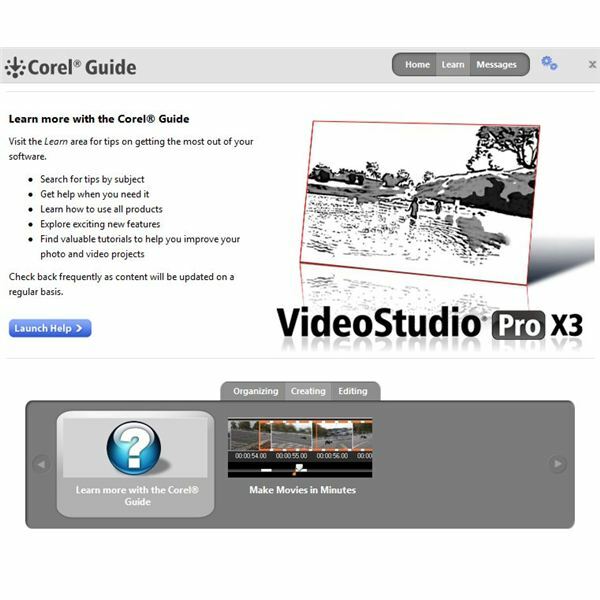 Further, you can click on the Launch Help button in the Corel Guide and be directed to VideoStudio Pro’s online help center where you can search for help on a particular topic or navigate through all of the available tutorial material. In addition to the added performance and workflow capabilities, VideoStudio Pro X3 also comes packaged with several new tools and features to improve the video editing process and allow for easier creative expression. One of these features is the ability to cut and paste attributes of a media clip. After spending the time to create the perfect look and feel for one clip, you can right-click on that segment and choose Copy Attributes. Then, you can select any other media clip and paste those same attributes to it, essentially applying all of the attributes of the first clip to the second. This is a great time-saver and a quick way to give a uniform look to an entire video editing project. 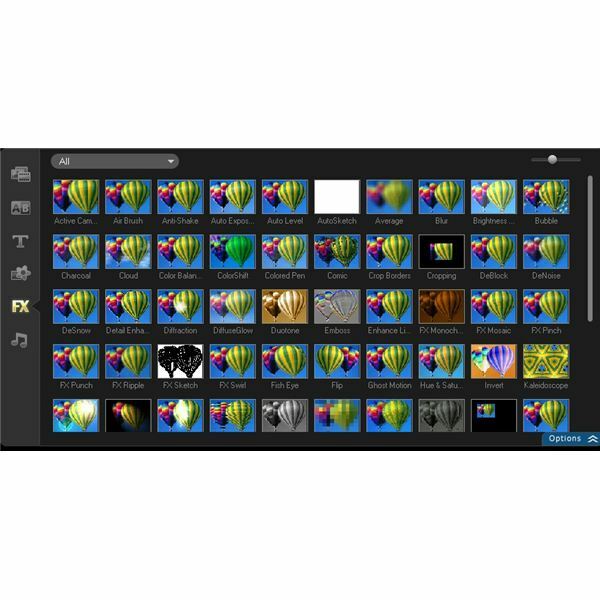 VideoStudio Pro X3 also includes a number of new effects, such as the ability to turn an entire video into an animated clip with the application of a single filter. The software also comes bundled with a collection of instant project templates that let you quickly create a professional-looking movie simply by replacing clips in the template. In fact, you can replace any clip in any project, so that you can maintain all of the attributes applied to the original clip and only change the underlying video or image. Within the Sharing tab of VideoStudio Pro X3, you can save your finished project in a variety of formats and upload your videos to a number of sharing sites, such as YouTube or Vimeo. You can also export your video to mobile device formats like iPod and PSP or burn it to a Blu-ray disc. 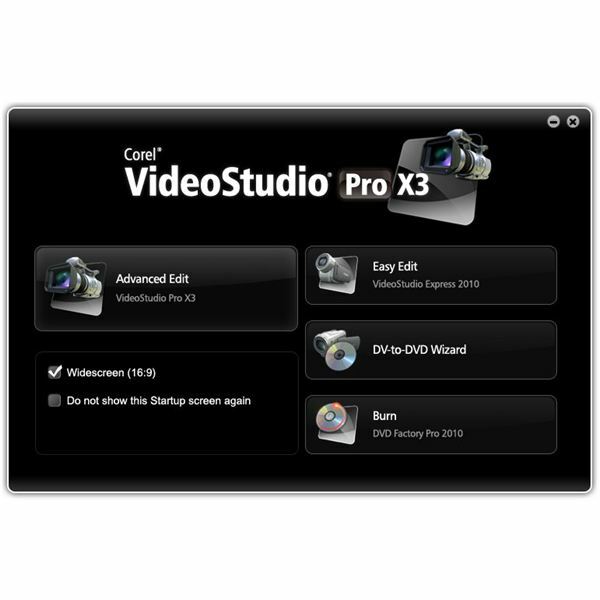 The suggested retail price for the full version of Corel VideoStudio Pro X3 is $99.99, and the upgrade price is $79.99. If you’re also interested in picking up PaintShop Photo Pro X3, you can buy the products in a bundled package for $149.99. Considering the substantial upgrades that have been made to both products, this is a very nice deal. VideoStudio Pro X3 is not only a major upgrade of the video editing suite, but it’s an impressive one as well – definitely worth the investment. If you’re a veteran user of the software, you’ll quickly see that the new release is way more than just the old application with some added fluff – instead, it’s a true advance that enhances the capabilities found in prior versions and adds some brand new tools that are sure to become staples of your workflow process. On the other hand, if you’re new to the VideoStudio line, you should appreciate how easy the software is to learn and use, despite its high-powered features and functionalities. For more details about some of the features of VideoStudio Pro X3 and how they work, check out the following articles.